Want to Know How to Grow Cilantro? 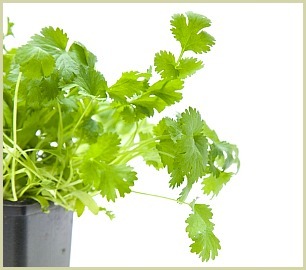 Knowing how to grow cilantro and you can have the freshest, tastiest leaves and seeds from early spring to late autumn. If you do grow herbs then you'll appreciate the difference in the freshness of taste between fresh and dried herbs. If you live somewhere with a mild, sunny climate, the cilantro herb is fairly easy to grow. Plus, as it's both a herb and spice, you get both the leaves and seeds all on one plant. Click here for more info about this herb. Because of its quick growing time, it quickly goes to seed so it's a good idea to make repeated sowings every 4-5 weeks for a continual fresh supply. For easy harvesting, I plant mine outside my kitchen door on the patio. In a sunny sheltered spot, you can sow the seeds straight into the ground in spring, or sow in large pots or containers. Added at the end of cooking, I find the young fresh leaves indispensable when making curries, soups or stews and the ground seeds are essential for my spice blends and mixes. Return to the main how to grow herbs page. Growing Chives - Probably the Easiest of All!